This is where I park my Christianity Today columns and other pieces I've written. Hope you like 'em. Ronald Rolheiser, a Catholic writer, distinguishes between meditative and contemplative prayer. In the former, he argues, we are active and verbal. In the latter, we are passively inarticulate. When we try to perceive God, Rolheiser suggests, we're often like a fish who asks his mother, "Where is this water we hear so much about?" First, the mother might set up a projector at the bottom of the ocean to show pictures of the sea. Then, she might say, "Now that you have some idea of what water is, I want you to sit in it and let it flow through you." That difference—between thinking about water and actually attending to it—is like the difference between meditation and contemplation. Epistemology (the study of how we know what we know) often emphasizes knowledge rendered in propositional statements: I "know" that 2 + 2 = 4. But there is also "acquaintance-knowledge," gained through direct encounter with another person, place, or thing. Many non-English languages have a distinct vocabulary to signify the profound differences between these ways of knowing. For example, the verb for knowing something factually is wissen in German and sapere in Latin, while "acquaintance-knowledge" is designated kennen (German) and cognoscere(Latin). The first kind of knowledge is general, abstract, and easily put into words. The second is individual, particular, and often hard to articulate. You find wissenin textbooks and creeds; kennen comes through relationships and experience. One of my favorite preachers says that, by Tuesday, he must "break the back" of whatever passage he's going to teach on Sunday. In this mode he's seeking wissen—knowledge of the text that he can codify, control, and explain to his congregation. Alternatively, one of my favorite contemplatives says that his faith only flourishes when he lets a passage break him. He uses the practice of lectio divina ("sacred reading," or dwelling on a text to listen for the Holy Spirit) in order to pursue a more direct encounter. I believe both modes are essential. God indeed invites us to "come . . . reason together" (Isa. 1:18, ESV). He also implores us to "be still, and know" that he is God (Ps. 46:10). In the earliest Latin Bible translation, the verb for "know" in this passage appears as cognoscere—acquaintance-knowledge—not sapere. Perhaps it's fitting that I devote my final Wrestling with Angels column to exploring the power and limits of words. We've exchanged a lot of them over the past five years, and I'm deeply grateful. Rest assured, I'm not giving up on language—you can count on my circumlocutious wordiness in future pieces for ct and, Lord willing, in songs and books to come. Yet I hope to write without the assum­ption that everything knowable can be named in words. Our God is both the Word who became flesh (John 1) and the Spirit who "himself intercedes for us with groanings too deep for words" (Rom. 8:26, ESV). Let's swim not only in the sea of our own words and ideas about him, but also in his fathomless ocean of love. "Well, who are they?" I asked, gearing up for the inevitable right-answer celebration. But her reply caught me off guard. Laura is grown now, but I've been thinking about the pragmatism she exhibited as a toddler. Her no-nonsense take on the world (at least the world of Disney) is a perfect example of what sociologist Philip Rieff and philosopher Allan Bloom both described as a "low symbolic hedge." I encountered this idea in The Shattered Lantern, a book by Catholic writer Ronald Rolheiser. If many Westerners have trouble perceiving God's presence in daily life, then perhaps, says Rolheiser, the problem is that our culture lacks potent symbols. But Rolheiser warns that a low symbolic hedge drains the meaning out of experience. To illustrate, he imagines a middle-aged man beset by chronic back pain. What does this pain mean? It can mean that he has arthritis, a medical symbol; or it can mean he is undergoing some midlife crisis, a psychological symbol; or it can mean that he is undergoing the paschal mystery, that this is his cross, a religious symbol. Or it might mean all three. The symbols with which we enter and interpret our experience can be low (suffering arthritis) or high (being part of the paschal mystery!). God's apparent absence in ordinary experience is intimately connected to the diminished height of our symbolic hedge. I came to Rolheiser's book because two friends—a Christian and a skeptic—had confessed to longing for a sharper awareness of God's presence. Their failure to "feel" God left both women wounded. The Shattered Lantern reminded me that sensing God's presence is not the same thing as faith. God is near whether we feel him or not. "Blessed are those who have not seen and yet have believed," Jesus declares (John 20:29). Saint John of the Cross famously wrote of the "dark night of the soul," claiming that sometimes God withdraws his presence. Still, John of the Cross noted that in other cases the problem has more to do with our "blindness." Given that Jesus encourages us to seek in order to find (Luke 11:9), Rolheiser would have us cultivate a contemplative receptivity to God—trusting that, in general, we can sense his presence. In a culture of narcissism, pleasure-seeking, and restlessness, that receptivity can seem futile. A low symbolic hedge is both a cause and a symptom of our problem. Where earth once seemed, in the words of Elizabeth Barrett Browning, "crammed with heaven," it now often appears as flat as a laminated placemat. Where the poet saw "every common bush afire with God," we see only shrubs. Our low symbolic hedge is, in part, a byproduct of the modern dogma that nature is all there is. But it's also the fruit of our Reformation heritage, with its wariness of superstition. After all, Laura was right: Mickey and Minnie really are just strangers in costumes. It's foolish to pretend otherwise. But what about cases when there's truly more than meets the eye? When bread and wine are not just food and drink, but emblems of a body broken? When baptismal waters plunge us into death and resurrection? The ancient Israelites were not above raising the symbolic hedge when they needed to awaken themselves to God. In 1 Samuel 7, they pour out buckets of water to express repentance, and build "ebenezers" out of rocks to memorialize God's provision and deliverance. Sometimes water is more than water, stone more than stone. Much has been made of young evangelicals leaving "low" Protestant congregations for more liturgical churches. Maybe part of what they're seeking is a higher symbolic hedge. What would happen if our worship enveloped them with biblically grounded symbolism? Certainly, we should remain wary of counterfeit "strangers in costumes. " But we must also help ourselves remember that we've been invited into the drama of a mysterious and wonderful gospel—a truth stranger (in the best possible way) than fiction. Pascale Honore loves watching her sons tackle the Australian surf. A woman not easily intimidated, she would join her boys in the waves were it not for a 1995 car accident that left her paraplegic. Bound to a wheelchair, surfing was not an option—until one of her sons' friends had an idea. Tyron Swan, 23, is a strong and skillful surfer. "I could duct tape you to my back and surf," he said to Pascale, 50. Pascale didn't see why he couldn't, and, armed with several rolls of tape, they set out to test their plan. Pascale "can't find the words to explain" what it's like to move through the ocean, to feel like she's "part of the water" after years of immobility. For his part, Tyron notes that surfing with an extra 88 pounds taped to his body is "a pretty good challenge." But his nonchalance can't mask the significance of his gift. "It's changed her life in a way," he admits. 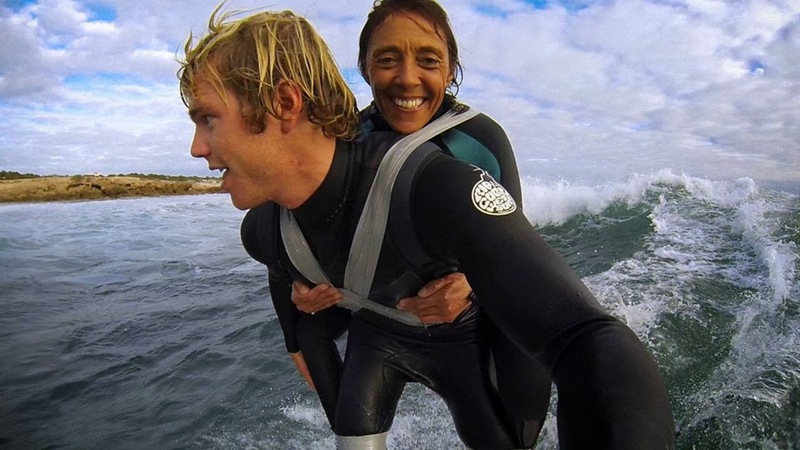 Pascale and Tyron's adventures have been chronicled in a short documentary, Duct Tape Surfing. It's the sort of clip you think would take the Internet by storm, and that's exactly what it has done. How could anyone not be moved by Pascale's courage and Tyron's tangible friendship? If my fellow Christians are anything like me, I suspect they can't watch the footage without seeing a powerful metaphor for spiritual friendship. Is there any more vivid embodiment of "bear one another's burdens" (Gal. 6:2, ESV) than a sturdy Tyron rising up on his surfboard with a grinning Pascale on his back? Is there any richer example of the way trust can make possible things once thought impossible? When we use words like evangelism and discipleship, are we not daring to dream that we who have already experienced the waves of God's mercy might somehow lead a friend or two into the water? I must resist the urge to reduce Pascale to a sermon illustration. But there is a detail in her story that I can't help relating to the matter of spiritual friendships. It has to do with duct tape. Wherever the Duct Tape Surfing documentary is posted, there is space for viewers to leave comments. Several folks have asked about having a company make a professional-grade harness, eliminating the need for the reams of silver tape that Tyron cuts off with a fishing knife after every outing. "Pascale was sent a number of harnesses to try but realized that duct tape is the best as Ty needs her in a certain position," explains Mark Tipple, the film director. "Too low, and he's off balance, or if she's too high, he can't raise his head while paddling and can't see. For now, duct tape is the best!" Where prefabricated solutions have failed, duct tape lets Pascale and Tyron customize, adapt, and fit themselves together as needed. Here is where my mind makes the leap back to spiritual friendships. There are many evangelism and discipleship programs available, chock-full of great ideas. But I am learning, in my halting attempts at spiritual friendships, that no one believes, disbelieves, questions, or grows in exactly the same manner. There is no one way to share the faith or invite someone deeper into it. While programs give us ideas, successful spiritual friendships are built upon adaptive, responsive, trusting relationships as unique as the people who inhabit them. As a teenager, I spent several weeks going through a life-changing discipleship program with my youth pastor's wife, Pam Mitchell. Although I'm grateful for the material we worked through, I can't remember anything about the curriculum we used. What I remember, above all, is our friendship—the way I could trust Pam completely with my hurts and hopes. As she lived out the Scriptures we were exploring, I longed to swim where she swam—to follow her as she followed Christ (1 Cor. 11:1). There is a give and take to discipleship, a discovery of how a would-be mentor's strengths and experiences align with a friend's questions and quandaries. Spiritual friendship should be as much listening as leading, as much discovery as discourse. Forcing that friendship into preconceived patterns will almost certainly sink it. And so, whether I am the mentor or the mentee (or, often, both), I am trying to embrace something like duct-tape discipleship. It's stickier, and messier, than some of the prefabricated solutions. But it takes an approach as adaptable—and tenacious—as duct tape to be the kind of friend who dives in deep and, like the Proverb says, "sticks closer than a brother" (18:24). Some folks understand this. Some think I'm kidding. And others are skeptical that such a carnal thing as a Tex-Mex appetizer could provoke genuine worship. We Christians have a long history of mixed and sometimes openly hostile attitudes toward sensual pleasure. Saint Augustine is the fourth-century poster boy for our dilemma, struggling in Book X of hisConfessions to rein in each of his five senses. He attempts, for example, to "take food at mealtimes as though it were medicine" and to "fight against the pleasure in order not to be captivated by it." Augustine is ever-vigilant that pleasure in created things never replace our desire for the Creator. His caution is well taken. But lately I've been discovering an emphatically propleasure voice in the writings of another Christian guide. In Letters to Malcolm: Chiefly on Prayer, Lewis argues that the pleasures derived from forest moss and sunlight, bird song, morning air, and the comfort of soft slippers are "shafts of [God's] glory as it strikes our sensibility." Our task is not to guard against sensual enjoyment, but to allow our minds to run "back up the sunbeam to the sun"—to see every pleasure as a "channel of adoration." Lewis even argues that there is no such thing as a "bad" pleasure—only pleasures "snatched by unlawful acts." But he is not blind to the "concupiscence" (lustfulness) that so haunts Augustine. When our response to pleasure is greed instead of adoration—when we seek to grasp and possess rather than receive—our healthy cry of "This also is Thou" distorts into "the fatal word: Encore." In his introduction to The Four Loves, Lewis distinguishes between "Need-pleasures" and "Pleasures of Appreciation." The enjoyment we feel upon receiving a Need-pleasure—water to quench thirst, for example, or the scratching of an itch—is intense but short-lived. But with Appreciation-pleasures—nonessential things that awaken us to delight, like delicious smells and tastes and scenes of beauty—the sensation intensifies over time. Greed—the repeated cry of "Encore!" to, say, rich black coffee or extra-creamy queso—may transform a Pleasure of Appreciation into a Pleasure of Need, draining out of it all the lasting enjoyment. The answer, Lewis contends, is not to avoid pleasure but to "have" and "read" it properly: to receive it, openhanded, as both a gift and a message. "We know we are being touched by a finger of that right hand at which there are pleasures for evermore. There need be no question of thanks or praise as a separate event, something done afterwards. To experience the tiny theophany"—the small sign of God's presence—"is itself to adore." In many respects, Augustine and Lewis are arguing two sides of the same coin. But there is a major point of divergence at the heart of their opposite orientations to pleasure. Where Augustine sees our sensuality as a liability to be managed until God "consign[s] both food and belly to destruction," Lewis views every earthly pleasure as an apprenticeship in adoration for the sort of thing that will go on forever in heaven. For Lewis, earthly meals are chances to practice the gratitude and adoration that will accompany our everlasting feast with God. Just as trials train us in patience, pleasure trains us in worship. Every sensual enjoyment (properly received) is a "tiny theophany"—a chance to "taste and see" that God is good, and a reminder that there is a whole lot more where that came from. Years ago, I toured as an opening act for Rich Mullins. There was something about Rich's music that stirred up people's deepest longings. I loved overhearing conversations at the autograph table; they often turned serious and urgent. More than once, a fan asked Rich how to discern the will of God. Rich would listen, and then offer an unexpected perspective. "I don't think finding God's plan for you has to be complicated," he'd begin. "God's will is that you love him with all your heart and soul and mind, and also that you love your neighbor as yourself. Get busy with that, and then, if God wants you to do something unusual, he'll take care of it. Say, for example, he wants you to go to Egypt." Rich would pause for a moment before flashing his trademark grin. "If that's the case, he'll provide 11 jealous brothers, and they'll sell you into slavery." I'm not sure whether this satisfied Rich's fans, but I suspect his advice has stayed with them in the way it's haunted me. When I find myself wrestling with life decisions, I think of Rich's Egypt Principle. It makes me laugh, and then it asks me to get down to the serious business of determining which of my options allow me to best love God and other people. Such an approach usually rules out certain possibilities, while affirming (and even creating) several others. Sometimes, once I've narrowed down my alternatives in light of the Great Commandment, the determinative "jealous brothers" do show up. A scholarship comes through at one school and not another. A job offer is escalated or rescinded. Other times, however, I'm left standing at the junction of several seemingly reasonable pathways, miserable with uncertainty. If only Rich were around to dispatch further wisdom! Recently, in a college music department faculty meeting, the topic of discerning God's will came up. We were discussing the decisions our students face, which often include whether to pursue a music career or enter church ministry. One teacher mentioned that he asks students to attend to their experiences of consolation and desolation. They should give special consideration to the directions that most consistently produce consolation, he said, while the avenues that create desolation should be approached cautiously. I was skeptical. If some of our students are led into music careers, desolation (rejection, obstacles, long drives in decrepit vans) will be normative. (I imagine the desolation level in church ministry is similar.) Often, the most worthwhile undertakings are the most difficult. Christians, as people of the Cross, should understand this best. Wouldn't a paradigm of consolation and desolation lead to avoiding anything challenging or unpleasant? While I teach at one college, I'm a graduate student at another. There, only a few weeks later, I re-encountered the consolation/desolation paradigm in some coursework on Ignatian spirituality. I began to realize that I had misunderstood these terms. Consolation is understood not as happy feelings (although they can be its byproduct), but rather as that which opens us up to God and others—and quickens our pulse for the things of the kingdom. Even difficult circumstances can lead to consolation if we sense God in them. Desolation, too, is more nuanced than I imagined. It has to do with that which distracts us from our awareness of God's presence and turns us in on ourselves (whether our immediate experience of the diversion is positive or negative). Ignatian spiritual direction reminds us that diligent attention to the movements of consolation and desolation in our own souls can help clarify which options lie within God's will. In moments of crisis, we can base our decisions both upon how we have sensed him moving, and also upon the God-given inclinations we've discovered within ourselves. I'm not certain whether Rich Mullins was familiar with Ignatian spirituality. But I know he paid attention to the things that opened him up to God—and the things God seemed to have wired him to love—and ran headlong toward them. That's how he ended up traveling with a ragamuffin band of friends, singing songs that made people hungry to find God's will. It's also how he wound up, toward the end of his short but ferociously lived life, on a Navajo reservation, teaching music to kids. Maybe that's why Rich could claim that loving God and others takes care of most of our discernment questions. After all, the psalmist assures us that if we delight ourselves in the Lord, he will give us the desires of our heart (Ps. 37:4). God can be trusted to teach our hearts what to desire, and to lead us—by jealous brothers, burning bushes, or quiet inclinations—to the places where our own unique giftings meet the movements of his kingdom. There we find consolation … and joy. My April Christianity Today column has gone online. I'm tempted to introduce it with dozens of caveats, clarifications and "other-hands," but I best just let it speak for itself, at least to begin. I'd love to have a conversation about it, though. Let me know what you think. On a recent trip, I had a conversation with a man who learned I was from Vancouver. He had lived there years earlier, and after asking if a particular music shop was still in the city, he told me a story. His wife was a piano major at the University of British Columbia. When they went piano shopping as newlyweds, the saleswoman led them straight to the entry-level models. "She had us pegged exactly right," the man told me. "We didn't have two nickels to rub together. We were going to have to borrow the money to get the cheapest instrument there." Everything changed, however, when the name of the prospective buyer's mentor—a world-renowned master teaching at the university—came up in conversation. The saleswoman was panic-stricken. "Not these pianos!" she exclaimed, herding the couple away from the economy section and into a private showroom of gleaming Steinways. "I'm so sorry," she kept repeating, horrified at the thought of the teacher finding out she'd shown one of his students an inferior instrument. Try as they might, they couldn't persuade her to take them back to the pianos they could afford. Once the master's name came up, only the best would do. "Hallowed be thy name," I said this morning, mumbling my way through the Lord's Prayer. I've prayed that phrase countless times. But today, I find myself thinking about the reverence a flustered piano saleswoman had for a teacher's name, and the prayer begins to change shape. What does it mean to "hallow" God's name? I was raised to flinch whenever someone uses it as a mindless exclamation or, worse, a curse. I've heard about the extreme care taken in branches of Judaism: Pages containing the name of YHWH are never thoughtlessly discarded but rather buried or ritually burned. When I've prayed the Lord's Prayer, I've tried to cultivate that kind of personal reverence for his name—even while living in a world prone to profane it, and a church apt to make puns with it on T-shirts. I'm glad I was taught to avoid blasphemy. But I'm beginning to suspect that my understanding of what it means to hallow God's name has barely scratched the surface. Names are a big deal in the Bible. From Abraham ("Father of Many") to Jacob ("Heel-grasper") to Peter ("Rock"), monikers don't merely identify, they reveal. Moses understood this. So he asked God (whom he knew by the generic deity designation Elohim) for his personal name. "Yahweh," God told him, offering Moses the kind of intimacy that only comes on a first-name basis—and revealing his covenant with his people in the process. Every name we have for God is a revelation of his character. So making his name holy must have something to do with revealing him here on earth. But a review of the human track record tells us this isn't our specialty. There is a scene in the 1999 CBS miniseries Jesus that haunts me. Jesus is in agony in Gethsemane, and Satan comes to tempt him one last time. In a devastating move, he shows the Lord a preview of the evils that will be done in his name, and asks if his sacrifice will be worth it. The scene is not from Scripture, but the scenario it proposes is powerful. In the shadow of the Cross, did Jesus observe all the wrongs—catastrophic and petty—we'd credit to him? Did he see inquisitions and gas chambers, defenses of slavery and "God hates fags" placards? Did he anticipate the way we'd use his name as a political trump card, or speak for him and pronounce his judgments in the wake of tragedies? Did he hear us mutter, when confronted with need, "God helps those who help themselves"? Did he want to shout that he'd said no such thing? We can only guess at all he endured in the garden, but we know for certain that when one of his friends sliced off a soldier's ear, Jesus put it back on. "You can't hallow my name," the gesture seems to say, "if you're associating it with something I would never do." Thanks be to God, many of his disciples have altered the course of human history with the good done in his name. And yet, 2,000 years later, we still have a propensity to wield our swords—rhetorical and otherwise—on his behalf. In light of all this, the Lord's Prayer takes on new urgency. None of the six petitions Jesus taught—for God's name, kingdom, will, bread, forgiveness, and deliverance—are things we can obtain on our own. In fact, all the verbs are passive. This means that the first request is not really, "Let us hallow your name." It's more, "Father, do what we can't—make your name holy in all the earth." Only God can reveal himself to the world. But if we pray as he taught us, our reverence and care for his name will grow. That's when we'll begin to exchange our cheap instruments of self-interest and power for the costly cross of Christ—the only instrument worthy of our Master's name. www.carolynarends.com Hello. I'm Carolyn Arends. I'm a singer/songwriter, author and speaker, and I've recently released my 10th CD, LOVE WAS HERE FIRST. I'm also the author of WRESTLING WITH ANGELS, WE'VE BEEN WAITING FOR YOU, and a NEW EBOOK entitled THEOLOGY IN AISLE SEVEN. I write a bi-monthly column for CHRISTIANITY TODAY, and I do film reviews for their online movie site. Most importantly, I am Mark's wife and Ben and Beth's mom. We all live in Surrey, BC, Canada with our dog Jersey and an undetermined number of fish. 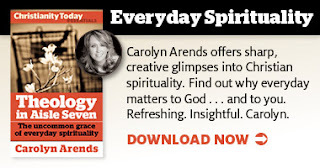 LOVE WAS HERE FIRST: Order Carolyn's new CD now! THEOLOGY IN AISLE SEVEN: Download the Ebook! Older articles, film reviews and book excerpts are archived on my website.